It's easy. 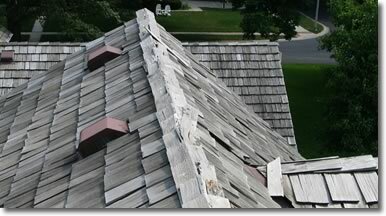 We're more thorough, which means we end up finding more defects than other inspectors. During your inspection contingency period you can negotiate with a seller to make repairs, lower the sales price or give you a credit at closing. So the more thorough the inspection is, the more you know AND the better prepared you are to negotiate and to save more money ($$$$). We don't rush. We don't do more than 1 or sometimes 2 inspections a day, unlike many competitors that try to crowd in 3 OR 4 hurried inspections a day. We take the time to do a thorough inspection of your new home. This also means that we charge a little more than most of our competitors. You don't want a cheap inspection. A cheap inspection may be the most expensive thing you'll ever buy, it may cost you thousands of dollars down the road in unexpected repairs because of missed or overlooked defects. 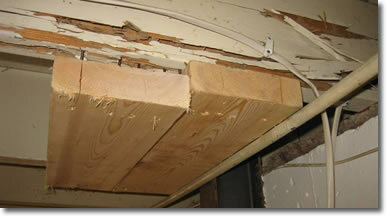 Cheap home inspectors often know less, have less training and do less, which is one reason they're so cheap. OR they are often brand new just starting out, AND trying to learn how to inspect on your new home. This is an important step in your life and we understand that. We want to make sure you have an enjoyable inspection experience. Our 100% Guarantee is one more way to demonstrate to you our desire and commitment to meet and exceed your expectations. 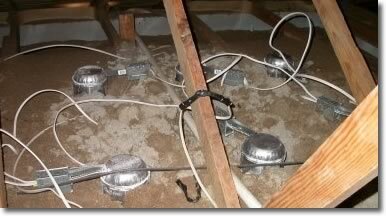 Client must be present and attend the full home inspection with us. If you are not satisfied with the quality of the home inspection service, tell the inspector before receiving the report and we make it right OR you don't pay the home inspection fee. A signed "Informed Inspection" release form must be signed to initiate the process. "We are writing today to indicate your claims experience with our limited warranty program offered nationally through home inspectors is absolutely perfect. Since you joined our program in 2003 and began providing the limited warranty to your home inspection clients, we have not received a single claim from any of your clients in those many, many home inspections you have performed during that more than 15 year period. Generally speaking, most of the home inspectors we work with are well qualified Through training and experience, however your record is indeed outstanding and speaks directly to your high degree of professionalism in your chosen field. There are few, IF ANY, of our more than 2,400 inspectors around the country who can claim such a high degree of success in serving and protecting their clients in the home buying process. You are to be congratulated and we are proud to be doing business with you." Play These Short Videos to Discover Many of the Shocking Things Uncovered During Routine Inspections in Kansas City and surrounding areas. "Don't Get Stuck Buying a Money Pit!" that is a fire or electrocution hazard! are a they are very active. Chimneys:: Out of sight – out of mind. 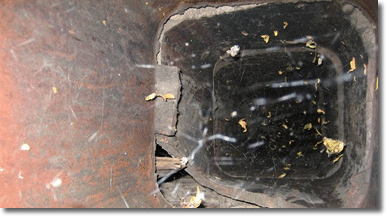 Many people have damaged flues and don't even know it. This is a fire waiting to happen. 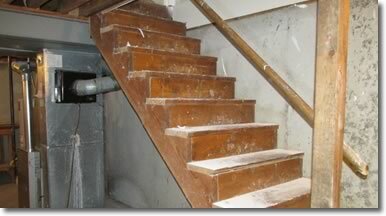 Stairs : There should be NO gaps over 4" wide at stair rails. sinus or nasal problems. 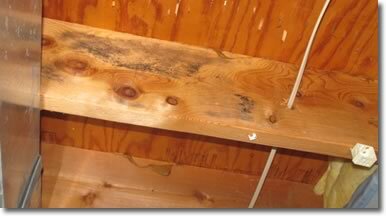 It could be caused by mold. or give your insurance a way to deny coverage. 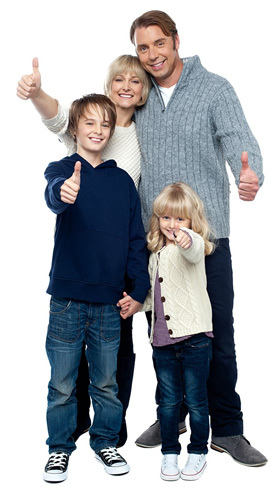 We want you to come along with us during the course of the home inspection. Okay, if you’re a seasoned home buyer it may not be as important that you’re there the entire time. Please know that our Saturday schedule is limited and on a first-come, first served basis. So please call now to let one of our schedulers know as soon as possible if you need a Saturday inspection. We’ll do our best to accommodate you! 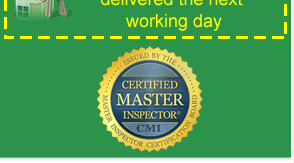 Not only are we Home Inspectors but we are also Licensed Residential Contractors and Certified Code Inspectors. Manager / Head Inspector Dan Bowers was one of only a few people approved to teach the State of Kansas's Home Inspector's Licensing course. So ask yourself, WHO do you want inspecting your home for you – The Trainer OR the Trainee? We know more about the "nuts and bolts" of how a house is put together than other companies. 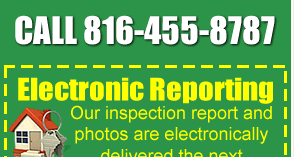 Contact us for your Home Inspection needs in the Kansas City Metro or surrounding areas. See what makes us so different from every other inspector in the area. 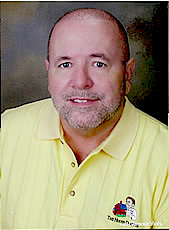 We use 2 OR more inspectors on ALL full Home Inspections. With our multi-inspector approach you get a more detailed inspection in less time.